Mortgages are long term loans for the purpose of buying a home. An Interest-Only mortgage is a new twist to an old procedure. For years those who were falling behind with their mortgage payments would reach an agreement with the lender to pay only the interest for an established period of time during which the principal would not be reduced. Interest-only mortgages are designed from the beginning to allow the purchaser to pay only the interest for a limited time while the principal remains unchanged. These mortgages are designed to allow the purchaser to establish their legal connection to a particular home, have smaller house payments for a specified time and thereafter start paying down the principal. This type of mortgage appeals to persons who want to purchase a particular home yet have a temporary cash flow problem or wish to hold back their funds for investments. An example of such a home buyer would be someone who is relocating to the area and needs their ready cash for relocation costs, utility deposits, furniture, etc. Other such buyers could be persons who are starting a business and need their funds for business start-up expenses, with the hope that when the business gets going the cash flow will improve. Persons who are learned concerning investments or those expecting imminent inheritances or annuity returns may also find interest-only mortgages attractive. Although the payment process of interest-only mortgages may favor that of rentals, these obligatory agreements are much different. Those who rent have no legal claim to the property while those who obtain an interest-only mortgage do. For example, a person who agrees to the terms of an interest-only loan would pay only the interest part for a period of time, usually 5 or 10 years. At the end of this introductory period, both interest and principal payments are made. The interest rate can be less during the introductory period; however at this point, interest rates can change dramatically. A person who does not plan to stay in an area for long may choose to rent rather than buy eliminating the process of buying and selling a home. The complexities of mortgages are difficult to understand. Yet, because of the significant cost of real estate most people cannot afford to make an outright purchase of a home. They must borrow the funds needed for the purchase and pay for them over an extended period of time. Prospective homeowners apply for loans from banks, mortgage companies or other lending facilities. The lending institution prepares a mortgage agreement that certifies and legalizes the loan. The lender accepts the property as collateral for the mortgage loan with the understanding that should the purchaser default, the bank processes a foreclosure and eventually the ownership of the property reverts to the bank. Mortgages are typically designed to cover a 30-year payback period; however, shorter periods may be offered, requested or required. Interest is a fee charged by the lending institution for the use of the funds. The terms of mortgage agreements vary greatly from lender to lender. In addition, most lenders require the home insurance and the taxes to be included in the monthly payments. They are held in escrow and paid by the lender when due. The purchaser does not take full title to the home until the loan is completely paid off. Other types of mortgages include Two-part mortgages that allow for the repayment for the home loan to be paid back in two parts. Two-part mortgages usually have a set interest rate for part one and at the point that part two begins, the interest rate is adjusted. The second rate stays in effect for the remainder of the contract. There are also Reverse Mortgages that are designed to allow persons 62 years of age or older to receive a line of credit based on the equity they have in their home. These loans do not require repayment while the owner is still living in the home. Fixed-rate mortgages are the most typical mortgage agreement. These loans are made for a specified amount, at a specified rate and for a specified time. This agreement stays constant throughout the life of the loan repayment. An example of a fixed rate mortgage would be a home purchased for $200,000, at a rate of 3% for a period of 30 years. With monthly payments of $843.21, at the end of the 30 years, this home will have cost the homeowner $303,355.60. 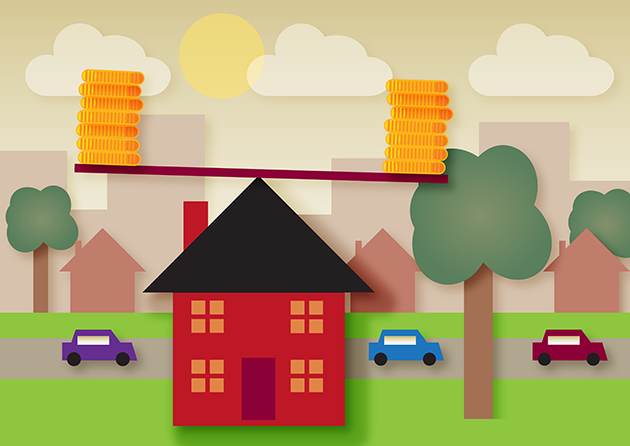 Mortgage agreements can also vary in the way in which the loans can be paid off early. Some lending institutions allow “principal only” payments in addition to regular principal/interest payments. This type of action reduces the overall cost of the real estate and loans can be paid back much faster. Other lenders impose penalties for early payoffs. An example of a fixed-rate mortgage for which the home purchases pays principal-only payments would be the home mentioned above. If this person pays an additional $100 per month as principal-only, the house would be paid off in approximately 25 years and cost approximately $282,470.00. For this same $200,000 home, if the first 10 years were classified as interest-only, the payments would be $500 per month for the first 10 years. After 10 years, the payments would be $1,109.20 per month, assuming the interest rate stays the same, resulting in the total price of the home at $326,208.00. Some purchasers prefer mortgage agreements with rates that are adjustable. They prefer to take the risk of interest rates not increasing enormously, thereby for a period of time holding the payments of larger loans to a minimum. Adjustable rate mortgages usually allow for a lower rate for a fixed period of time followed by rates that adjust for the remainder of the time. This type of financing may prove beneficial for those who do not plan to live in the home for an extended period of time. Those who wish to buy and sell can benefit from ARM mortgages because the initial period of repayment reflects a lower interest rate. Interest-only mortgages differ from adjustable rate mortgages. When the purchaser makes a payment to an adjustable rate mortgage, his payments are for both interest and principal. Adjustable rate mortgages can be of any combination of fixed rate/adjustable rate positioning. For example a 1/1 ARM would have a fixed rate for the first year with the interest thereafter being adjustable on an annual basis. A 5/1 ARM would have a fixed rate for the first five years with the interest thereafter being adjustable on an annual basis. A 5/5 ARM would have a fixed rate for the first five years with the interest thereafter being adjustable every five years. Two-part mortgages are loans that allow for the repayment of home loans to be repaid in two sections. Two-part mortgages usually have a set interest rate for part one and at the point that part two begins, the interest rate is adjusted. The second rate stays in effect for the remainder of the contract. This type of financing has the appearance of being two completely different mortgages rather than one with two separate pay-back procedures. Reverse Mortgages are designed to allow persons 62 years of age or older to receive a line of credit based on the equity they have built up in their home. These loans do not require repayment while the borrower still owns the home and while the borrower still lives in the home. These mortgages are intended to establish a line of credit for the owner to be drawn upon for the remainder of the owner’s life. Thereafter, the financial institution would hold a lien on the property for the outstanding balance which would become an encumbrance on the owner’s estate. If the borrower should pay the loan off, no liability for repayment would be applicable to the owner’s estate. Not everyone wants the responsibility of owning their own home. Some people like to rent property that is owned, insured and maintained by someone else. Property that is time-shared, designated as a condominium or even some apartments takes on the characteristics of renting but is actually purchased. With time-shared property, the group of purchasers divides the usage of the property by weeks or months allowing usage only to the joint owners. Additional fees are imposed for taxes, insurance, maintenance, etc. A renter has no legal claim to the property. Even after renting for a long time, the renter has no equity built up in the property. By the same token, a purchaser using an interest-only mortgage does not build up equity until the time the principal payments begin. Interest-only mortgages allow for a period in the beginning of the contract for the buyer to pay only the interest due at that time; however the principal is not reduced. These mortgages appear similar to renting, but the interest-only mortgage grants the purchaser a buyer’s interest in the home while renting does not. Purchasing a home and assuming a mortgage is a very big step. Some people fear the idea of being in debt for such a long time. Some fear not being able to sell the home if their employer transfers them to another city. Some fear the repercussions if they should default. But most people dream of having their own home, to put down roots and to make some long-term memories. Somehow they manage to jump any hurdles that come their way, to pay off their mortgage and to know at last that their home is truly theirs.